Celebrity gossip. A guilty pleasure. Although I can only take so much of the actual gossip, I can't get enough of Celeb Style. Here are my 5 favorite celebrity moms who happen to be some of my fashion favorites as well. Can I just fangirl out here for a moment?! I La-OVE Kristen Bell. She's cute, she's funny, she seems down to Earth and doesn't take herself too seriously. Plus she's Veronica Mars. The perfect girl crush. One thing I love about her is she still has not released pictures of her daughter, Lincoln. Kristen wants to give her daughter the choice of being a "public figure." No matter what political affiliation you have, you can't deny that the First Lady has been very involved in the fight against childhood obesity by launching her "Let's Move" campaign. 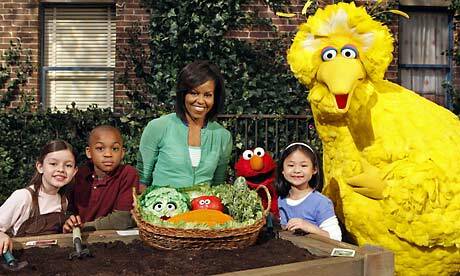 I've seen her on Sesame Street and various Nickelodeon programs discussing exercise and healthy eating. She has also become a trendsetter for women of all ages. Although Kate hasn't given birth yet, I'm still counting her in this list. She's been called "the next Diana." Sweet, classy and bringing back the classic conservative look...she is definitely a great role model for young girls today. Ok, I'll admit it. Back in my teen years...I was on team Kristin. But now, she is on this list mostly for her style. And her shoe line. I also like that she wanted to do the mommy thing on her own and refused to hire a nanny- unlike a lot of other Hollywood wives. I know, I know... you're thinking "uh, what?!" But Denise has maintained an abundance of class during Charlie Sheen's meltdown. She didn't bad mouth him to the media and she is now raising the children he had with Brooke Mueller. Good looking out for the best interest of the kids in both situations, girl!